I did it ya’ll! I have my plans ready for you to take a peek at for the second week in a row. 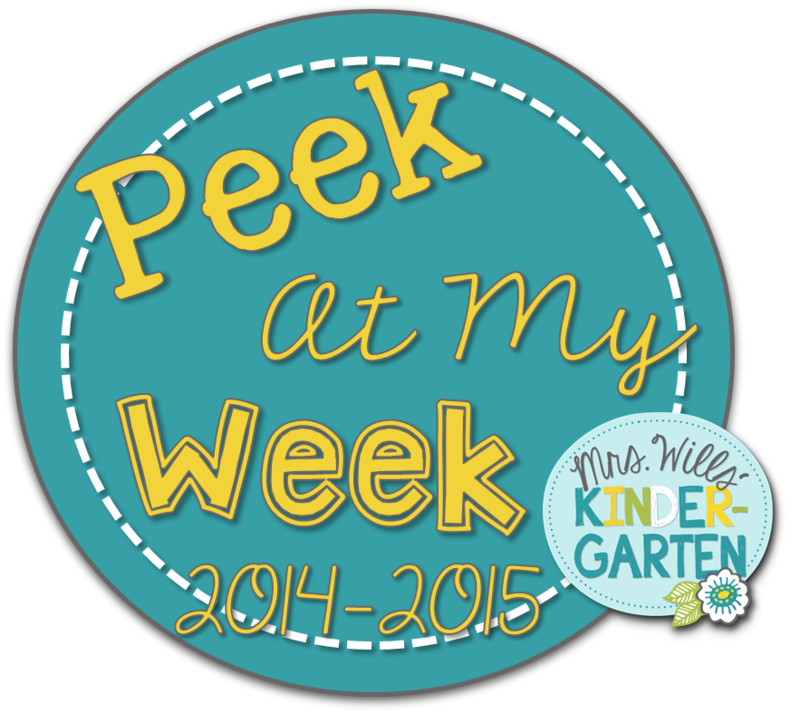 I’m linking up with DeeDee from Mrs.Wills Kindergarten to show you what we’ll be up to this week. As I mentioned last week, my lesson plans do not have to be super detailed. I keep them simple and to the point. Last week we had a lot of things we didn’t get finished due to unexpected events. We had someone pop into our room and talk about boy scouts. The counselor decided to pay us a visit to talk about responsibility. Those types of things happen and we just have to go with the flow. Lots of things you saw last week have rolled over to this week. We use GoMath for our curriculum. I’m not sure what I think yet. It is very fast paced and not much review. Since our TEKS changed this year, we have new addition and subtraction strategies we have to teach. I’ll be teaching the make a ten to add addition strategy and the use ten to subtract strategy this week. I know what you must be thinking…both in one week…it just can’t be done. Well folks, I don’t really have a choice. This curriculum gives us one day to teach each lesson with no spiral review. My partner and I are doing the best we can to fit everything in this year. I’ll spend two days teaching make ten and add and then two days teaching use ten to subtract and on Friday we will review. I’ve avoided teaching this concept for two weeks because I just don’t want to do it. It will be difficult for them and I’m worried. After talking with several of my blogging friends who are use to this strategy, I’ve come to realize that is just a strategy. They don’t have to master it. They don’t all have to get it. I hope that it’ll be beneficial for a few of them and if not, then we will move onto the next concept and not worry about it. 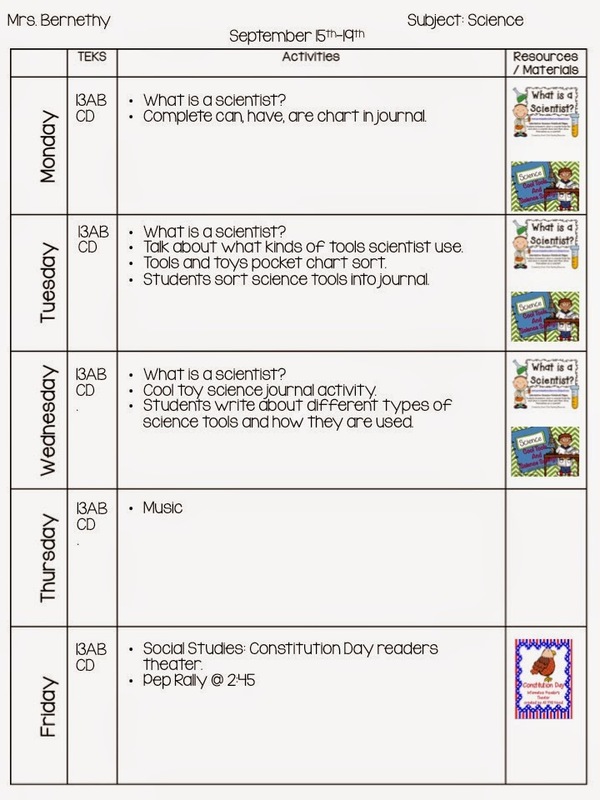 Here is a layout of what our week in math will look like. Click on any of the pictures to take you to a downloadable link. From there you can click on the resource pictures to take you links I got them from. Since our curriculum has no spiral review, I use math stations to help review previously taught concepts. I’ll be blogging about my math stations soon. Last week was our first full week and they started off rocky but ended up working out great. I have six groups, and I see each group twice a week. I’ll be using my make ten to add task cards and use ten to subtract task cards during stations to get more practice in. 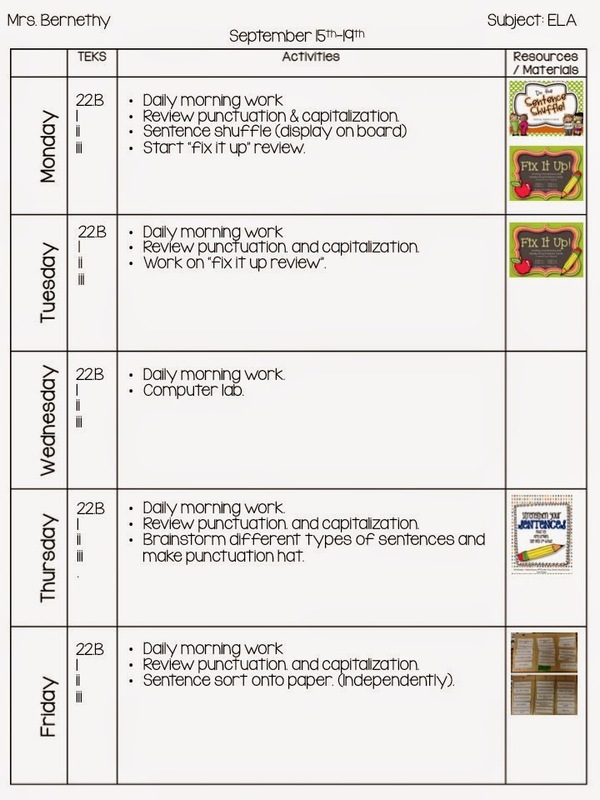 We will be wrapping up our punctuation and capitalization unit this week. 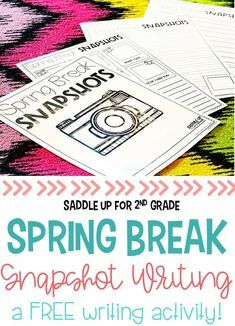 We get tons of practice with this each day during our morning work so I try to fill our lessons with fun, hands on activities instead of fixing sentences on a worksheet. We use Journey’s to teach reading. 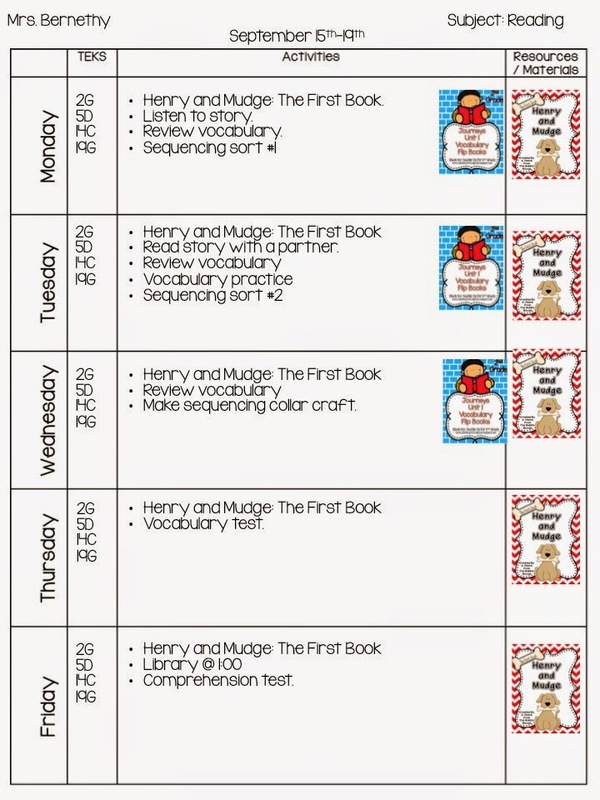 At the beginning of the year we spend two weeks per story to effectively teach and review concepts. 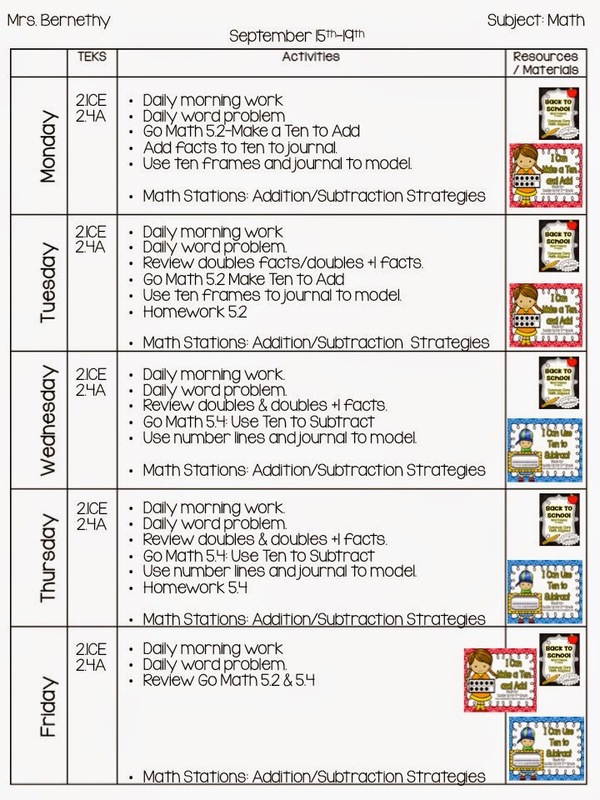 I also use Daily 5 in my classroom. I have 2 rounds of 15 minute whole group lessons (right now they are about 20 minutes while we are building our stamina) and then I have 3 rounds of D5 that are 20 minutes each (right now they are about 15 minutes.) Some days we might use both of our whole group time listening to the story or reading with a partner. Other days I’ll break it up into 2 mini lessons over the concept we are learning about. With Daily 5, we have done read to self and work on writing. They have them down. Now we are just working on building our stamina. I’ll be introducing read to someone this week. 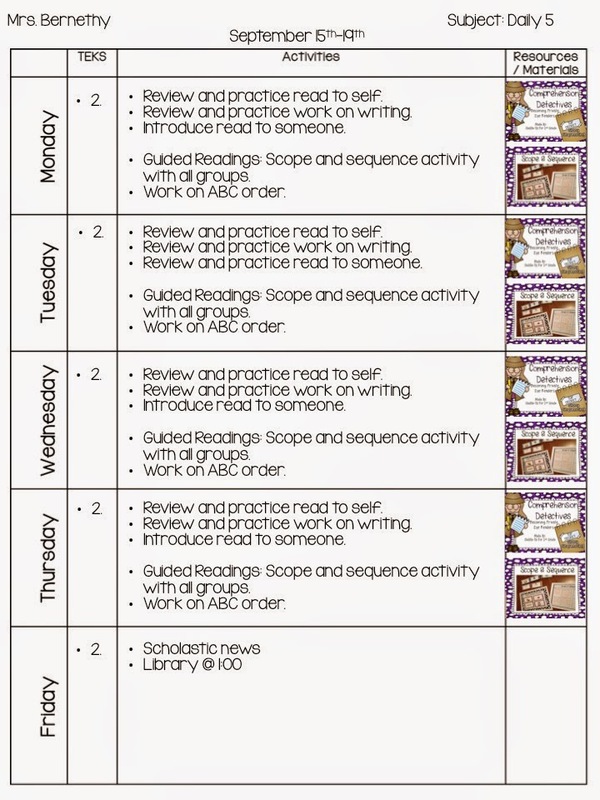 My first two rounds of D5 I’ll be working with small groups on sequencing. I’m using the scope and sequence activity from my Comprehension Detectives: Story Sequencing unit and reviewing ABC order. Until I get a better feel for my kids and what they need, I’m going to do the same activity during guided reading. Once we get further into the year, I’ll change things up for each group. My last round of D5 will be used to introduce and work on read to someone. Now onto science. I rotate teaching science and social studies. Each subject gets taught for two weeks and then I switch. We will start our first science unit and learn all about what scientists do. We already have our journals set up and ready to go. Wednesday is Constitution Day and our TEKS require us to teach about it. I don’t have time to cover it that day so I’m doing a quick readers theater on Friday to get it covered. Now I just have to stay on track and try to get it all in. Wish me luck!